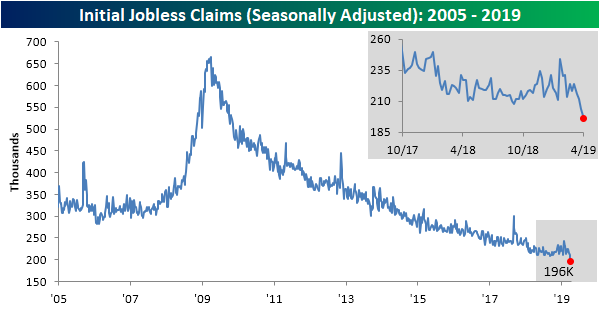 In addition to last week’s print, initial jobless claims data has seemed to have left the worrisome signs from earlier in the year in the rearview mirror. This morning’s stellar print of 196K was the lowest seasonally adjusted number since October 4, 1969 when claims came in at 193K. To further reiterate the strength of this indicator, the streak of consecutive weeks below 300K has now grown to 214; the longest such streak ever. Additionally, with older data having been revised a couple of weeks ago, the streak of readings at or below 250K is back on; now at 65 weeks. That is the second longest streak in the history of the data. The only one longer ended on January 1, 1970 at 89 weeks. Start a two-week free trial to Bespoke Premium to access our interactive economic indicators monitor to keep up to date on Initial Jobless Claims releases as well as many other US and global economic indicators. 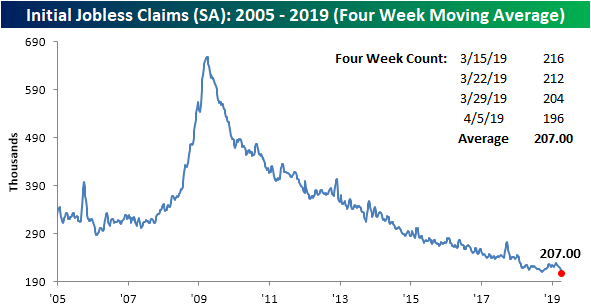 Earlier this year, we highlighted that the less volatile look at initial jobless claims—the four-week moving average—had come in at a 52-week high two weeks in a row; a possible recessionary signal though there were plenty of instances of it happening outside of economic downturns. The tide has completely shifted since that analysis as the four-week average is now at a 52-week low! At 207K, it is also now at its lowest level since late 1969. In other words, it can now be more confidently said those highs were more of a blip rather than a trend higher. The non-seasonally adjusted data deviated a bit from the other versions with an increase from last week’s 183.8K to 195.5K today. 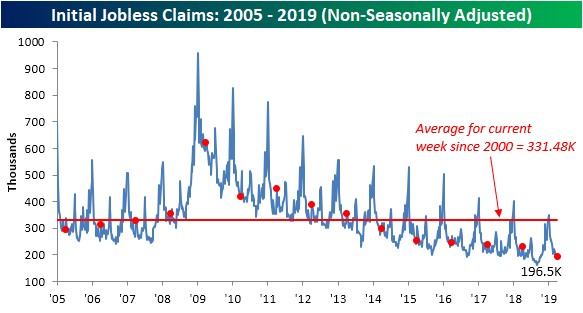 This increase is perfectly normal as a rise in claims for the current week of the year can be observed every year going back to 2011. Regardless of the increase WoW, this week’s NSA number is just over half of the average for the current week since 2000. Also being the lowest print for the week of the current cycle, the NSA numbers still appear very strong.